This article on the 16th (Queen’s) Lancers will provide you with an overview of the Regiment’s service during the First World War. In addition, it will explain which records are available if you’re researching a soldier who served with the Regiment. The 16th (Queen’s) Lancers was a distinguished British cavalry which served on the Western Front for the duration of the First World War. When Britain declared war on Germany on 4 August 1914, the 16th (Queen’s) Lancers was stationed at Curragh, Ireland where in March 1914 it had been one of the cavalry regiments involved in the Curragh Incident. The 16th (Queen’s) Lancers landed at Havre, France on 18 August 1914 and the Regiment’s movements can be followed by consulting the regimental history and war diary, both of which I’ve discussed below. The Regiment arrived in France as part of the 3rd Cavalry Brigade, The Cavalry Division. On 6 September 1914, the 3rd Cavalry Brigade joined Gough’s Command which became the 2nd Cavalry Division on 16 September 1914. The Regiment suffered three casualties from shell fire at the Battle of Le Cateau on 26 August, including its commanding officer Colonel MacEwen. Compared to other British cavalry regiments, the 16th Lancers didn’t see much action in August and September 1914. During a skirmish near Kruystraete, on 12 October 1914 soldiers of the regiment came across the mortally wounded great-grandson of Queen Victoria, Prince Max of Hesse. After the Western Front settled into trench warfare in the winter of 1914, the 16th Lancers moved into billets behind the frontline. The next three years for the Regiment were pretty uneventful, though it did spend some time dismounted in the trenches. The worst casualties the regiment suffered during the whole war was while in the trenches near Ypres on 21 February 1915. Three German mines were exploded under a portion of trench held by the 16th Lancers followed by an attack on the trenches either side of D Squadron. The Regiment suffered a total of seven officers and 47 other ranks killed, wounded and missing. The Regiment remained in Belgium until March 1919, when it returned to England. However, the Regiment’s respite would be short-lived as on 24 June 1919, the Regiment embarked on board SS Oxfordshire at Liverpool and disembarked at Port Said, Egypt on 6 July 1919. After less than two weeks in Egypt, the Regiment set sail for Beirut where it disembarked and moved to Rayak. For the next year and a half, the 16th (Queen’s) Lancers served in what is now Syria, Israel, Palestine and Lebanon before it moved to India in late 1921. I would start off by looking at my Guides to Researching Soldiers who Served in the British Army. These guides will help you to find medal and service records. For an overall history of the 16th Lancers during the First World War, I’d recommend combining the regimental history (discussed below) with the regiment’s war diary (also discussed below). Officers: Officers who served in the 16th Lancers are good candidates for research and you’ll usually be able to uncover a lot of information. Start off by searching for their service record at the National Archives, I offer a copying service for service records. If an officer served after April 1922 then their record should still be held by the Ministry of Defence. I have written a guide on my Second World War website Researching WW2 on how to order these records: Ordering a Service Record still held by the MOD. The war diary and regimental history frequently mention officers by name so both sources should be checked. The regimental history also contains a list of officers who served in the Regiment between 1911 and 1923, officer casualties with dates and officers who were granted honours and awards. 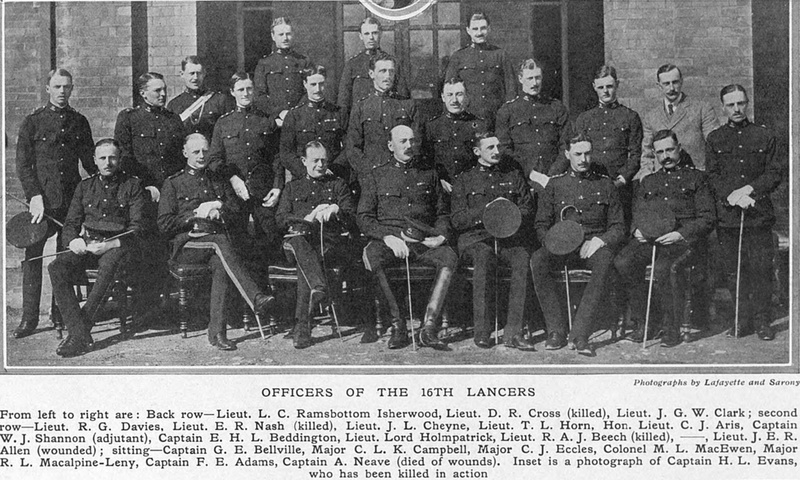 Newspapers are good resources to use when trying to find a photograph of an officer with the group shot below taken from The Tatler, 10 March 1915. Other ranks: Start by looking for a surviving service record and medal records. If a soldier served past January 1921 their service record should still be held by the Ministry of Defence. I have written a guide on my Second World War website Researching WW2 on how to order these records: Ordering a Service Record still held by the MOD. Even if a soldier’s service record hasn’t survived you can usually work out an approximate enlistment date by comparing his regimental number (if known) to those of soldiers whose records have survived. The regimental history contains a list of men granted commissions during the First World War and honours and awards. The history also contains a list of men who were killed, died, or died of wounds while serving with the regiment. If you’re researching a soldier who served in the First World War, you’ll need to search the resources on both Ancestry and FindmyPast. Clicking on the banner below will take you to FindmyPast and both sites offer free trial periods. If you like in Britain, you can often access the sites for free at your local library. There is only one war diary for the 16th Lancers which has been digitized and is available to download from the National Archives’ website by clicking on the blue link below. I have transcribed some entries at the bottom of the page. Notes: A good war diary, with more detail for 1914, February 1915 and 1916 and August 1918, but many of the other months have brief entries. There is a nominal roll of British officers and their squadrons on 8 and 25 August 1918 The only appendix is a Narrative of an Operation carried out by Officer Commanding C Squadron, 16th Lancers on 24 August 1918. I have transcribed a few entries below. The Sixteenth, The Queen’s Light Dragoons (Lancers) 1912-1925 by Henry Graham. A good book which can be read online by clicking on the link above. Covers the periods before and after the First World War which is very useful as there are fewer records to consult during these dates. Appendices include a list of officers and men who died serving with the Regiment during the war, a list of awards including those Mention in Despatches and officers who served with the regiment. I recommend this book to anyone wishing to know more about the 16th Lancers during the First World War. This regimental history has been reprinted by the Naval and Military Press and you can find it online. If you would like to learn more about the role of the British Cavalry on the Western Front I’d recommend Horsemen in No Man’s Land: British Cavalry and Trench Warfare 1914-1918 by David Kenyon. 12 October 1914: 4 am: Captain Onslow with D Squadron went as reconnoitring squadron to Caestre from there sending one patrol under Lieutenants Aris and Macneil to Mont des Catttes and one under Lieutenant R R Davis to Godewaersvelde. The Regiment did advanced guard to the Brigade. Captain Neave with A marching to Bope at 6 am. A squadron was sent on to Fletre. D was then at Thieushauk and Headquarters and C at Caestre. The Regiment was ordered to attack the monastery. A squadron on the right with the 19th Hussars’ MG advanced through Coq de Paille, C Squadron with our MG’s was in the centre and D on the left through Kruystraete. The Royal Horse Artillery shelled the place first and then the Regiment advanced. The Germans who were there went and we only found three wounded, one of whom was Prince Max of Hesse [great-grandson of Queen Victoria], who died in the night. C Squadron was sent on east about a mile as outpost. D and the MG held the trenches round the monastery and the remainder billeted there with 5th Lancers. 19 February 1915: In the trenches, distribution of Regiment, from left D A C. Three troops each in front trenches, one troop of each in support near commanding officer’s dugout. German trenches opposite running parallel from 15 to 45 yards apart. A cutting which had been there some days, which might prove to be a sap, was pointed out and ? under close and continued observation. It was in front of the left of D Squad. Through a dugout subsiding one man was killed [Isaac Frederick Wellbourn]. Perpetual sniping. All men hard at work, repairing parapet and draining trenches. About 10 am a message was received from 22nd Corps that hostilities would cease at 11 am and troops to stand fast on the ground they had then reached. Squadrons were ordered to hold the ground and remain in observation and not incur further casualties. 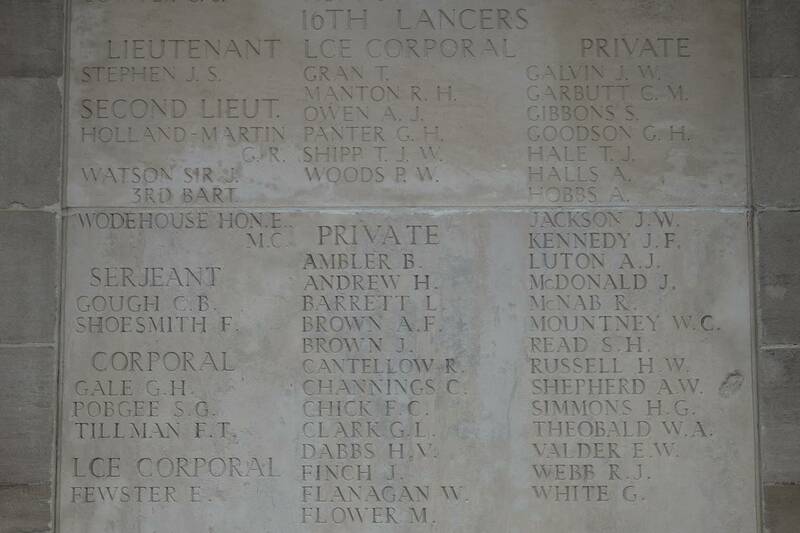 The panel above shows the 50 officers and men of the 16th Lancers commemorated on the Pozieres Memorial near Albert on the Somme. 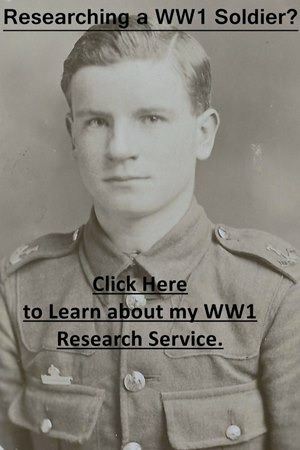 Percy William Woods, who I researched for a descendant, had volunteered in late August 1914 and spent a year training at Curragh, Ireland before he was sent abroad. Percy was killed fighting with the 3rd Dismounted Brigade between Jussy and Mennessis on the 23 March 1918. His brother, Leonard, died of wounds while serving with the Berkshire Regiment in August 1918.